A rare look at how music made a positive contribution to World War I. This picture book makes a striking first impression, opening with a double-page spread of sketched snapshots of 24 African-American soldiers that echo those in Shaun Tan’s The Arrival (2007). Each soldier, whether serious or smiling, gazes out at readers to introduce a story about all the ways the country for which they willingly fought still systematically discriminates against them even during wartime. Like these seemingly disconnected portraits at the beginning, episodic vignettes tell the story of how James “Big Jim” Reese Europe used music to motivate his troops under nearly insurmountable conditions; how the Harlem Hellfighters were often relegated to menial, “grunt work” jobs instead of being sent into battle, and how lynchings persisted at home despite their war efforts abroad. In the story’s most haunting image, the ship on which the soldiers sail passes through the ghostly images of slaves wearing neck shackles, reminding readers that the Middle Passage still affected these black men in 1917. 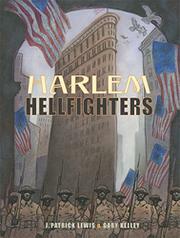 The narrative gaps and Lewis’ focus on so many different individuals and situations make this a work that packs an emotional rather than an informational punch; it’s best when used to supplement a more extensive study of the Harlem Hellfighters.